It’s hard to choose the best interaction to swim with dolphins with all the options in the market; however, the decision is way simpler when the habitats are amazing and the experiences offer a lot to the public. If you are still undecided about the best option to swim with dolphins, we share with you the best experiences that you can find, whether you’re going with your family, with friends or with your partner. This is the most exclusive experience for swimming with dolphins: only you and the dolphin. During 60 minutes, you will get along with the most intelligent mammal in the ocean. Where can you find this swim? Price for booking online The One Swim: $424.15 USD. Discover more about this swim here! There’s nothing better than creating memories with the person you love the most. Couples Dream Swim lasts an hour and is perfect for bonding with your partner and a magnificent dolphin. Price for booking online Couples Dream Swim: $339.15 USD. Discover more about this swim here! Can you imagine doing more than 16 activities with the dolphins along with 3 of the most important people to you? This is possible with Primax4 Swim. You and your friends can’t miss it! Price for booking online Primax4 Swim: $135.15 USD. Discover more about this swim here! If 3 friends are not enough, Primax Swim is your option, because you can share this experience with 5 friends, during 60 minutes of aquatic activities. What would you think of helping an Animal Care Specialist and communicating with a dolphin by yourself? This is possible thanks to the Trainer for a day swim. The best part is that this activity lasts 2 hours and a half and food and drinks are included. Price for booking online Primax4 Swim: $177.65 USD. Discover more about this swim here! If you want to walk under the sea, you can only do it in Mexico, specifically in Xel-há, Cancun. This is a very original swim with dolphins during which you must wear special equipment: sea trek. Try it! 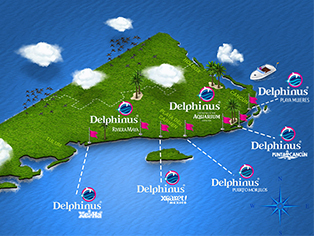 Price for booking online Delphinus Trek Swim: $126.64 USD. Discover more about this swim here! A great option for swimming with dolphins is this interaction, where you and 8 other people will share a fabulous encounter with this mammal. Price for booking online Interax Swim: $84.15 USD. Discover more about this swim here! Everyone in the family deserves their big moment with dolphins and kids are not the exception. However, kids must be over the age of 8 or accompanied by an adult. Price for booking online Delphinus Kids Swim: $58.65 USD. Discover more about this swim here! If your family is too big or you’re swimming with dolphins along with too many friends, this is your option. Here, you’ll be able to dance, hug, kiss and do a lot more of activities with the dolphins. Price for booking online Dolphin Ride Swim: $92.65 USD. Discover more about this swim here! This other swim is ideal for with big groups and also includes free transportation from your hotel. Since there are several habitats that offer this swim, the location of your hotel is not going to be a problem. Price for booking online Splash Swim: $75.65 USD. Discover more about this swim here! What are you waiting for to book your experience? Choose the best swim for you and enjoy unforgettable moments!